Night is the dark period between sunset and sunrise. 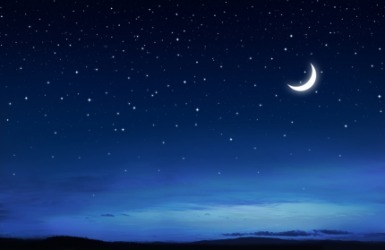 The hours between around 7 or 8 PM and 5 or 6 AM are an example of night. "night." YourDictionary, n.d. Web. 22 April 2019. <https://www.yourdictionary.com/NIGHT>. a. The period between sunset and sunrise, especially the hours of darkness. b. This period considered as a unit of time: for two nights running. c. This period considered from its conditions: a rainy night. The period between dusk and midnight of a given day: either late Thursday night or early Friday morning. a. The period between evening and bedtime. b. This period considered from its activities: a night at the opera. c. This period set aside for a specific purpose: Parents' Night at school. a. The period between bedtime and morning: spent the night at a motel. b. One's sleep during this period: had a restless night. Nightfall: worked from morning to night. Darkness: vanished into the night. Of or relating to the night: the night air. Intended for use at night: a night light. Working during the night: the night nurse. Active chiefly at night: night prowlers. Occurring after dark: night baseball. Middle English from Old English niht ; see nekw-t- in Indo-European roots. See also also darkness. achluphobia an abnormal fear of darkness. Also called scotophobia. noctimania an abnormal love of the night. noctivagation the act of walking or wandering at night. —noctivagant, noctivagous, adj. nyctalopia night-blindness. sciophobia an abnormal fear of shadows. scotophobia achluphobia. How do you sleep at night when you attack your kids like that!? (countable) A night (part of the days before and after it) spent in a hotel or other accommodation. (uncountable) A dark blue colour, midnight blue. From Middle English night, nyght, niÈt, naht, from Old English niht, neht, nyht, neaht, nÃ¦ht (“night"), from Proto-Germanic *nahts (“night"), from Proto-Indo-European *nÃ³kÊ·ts (“night"). Cognate with Scots nicht, neicht (“night"), West Frisian nacht (“night"), Dutch nacht (“night"), Low German Nacht (“night"), German Nacht (“night"), Danish nat (“night"), Swedish natt (“night"), Icelandic nÃ³tt (“night"), Latin nox (“night"), Greek Î½ÏÏ‡Ï„Î± (nÃ½chta, “night"). (paganism) The goddess of the night in Heathenry.